On February 20, 2018, at approximately 4:15 P.M. Joseph Grosso willingly came to the Easton Police Department and turned himself in on an outstanding warrant for his arrest for Breach of Peace from an incident that took place in early January, while the EPD were answering a medical call. Mr. Grosso was processed and released on a $2,500.00 surety bond, and given a court date of March 5, 2018. Majors/70 (ages 11-12) 8:30 a.m. -10:15 a.m.
AA & AAA (ages 8-10) 10:30 a.m. – 12:15 p.m.
Every year the JBHS Booster Club sponsors a great clinic for our youth baseball players ages 8-12 at which the Barlow baseball players and coaches will help everyone gear up for the spring baseball season with hands-on skills instruction! Please wear sneakers and bring a bat, glove and water bottle. Plus, there’s a raffle drawing at the end of each session! The clinic is offered free of charge. But donations will gladly be accepted to help raise money for field improvements and season expenses. Checks can be made payable to JBHS with Baseball Booster Club in the memo line. The JBHS Baseball Booster Club is a 501(c)(3) charitable organization and donations are tax-deductible to the extent allowed by the IRS. At the March 1 Region 9 meeting, a motion was made and approved to have a Student Resource Officer at Barlow. Motion: Move that the Region 9 Board of Education approve the implementation of a School Resource Officer beginning in the 2018-19 fiscal year, pending further discussion of funding options with Town Officials in Easton and Redding. The Town of Redding has agreed to provide Barlow with an officer for the remainder of the school year. The Region 9 board thanked First Selectman, Julia Pemberton for her assistance through the process of determining what’s best for Barlow. Click here to view the Facebook live stream provided by hello, News. 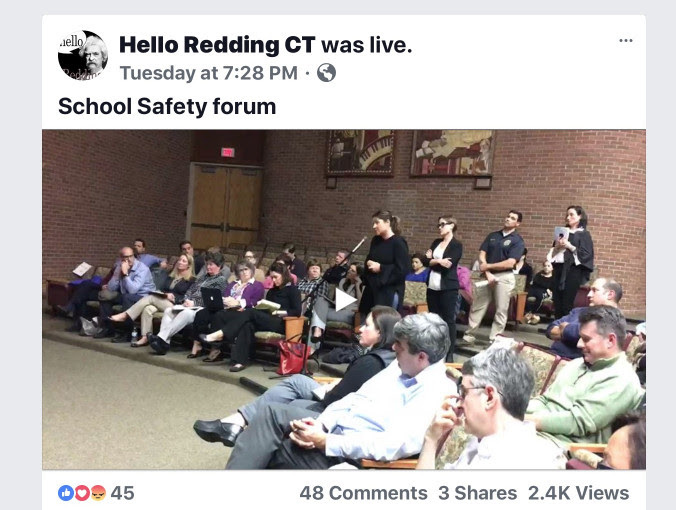 Concerned parents, students and community members, numbering about 240, came to Joel Barlow High School on Tuesday to attend a Redding/ Easton School Security Forum. Close to 60 others watched from home on the live stream provided by hello, Redding. Superintendent of Schools Dr. Tom McMorran started out with a short presentation. He talked about putting our children first and making our buildings even safer. Dr McMorran said that our priority was to work together to make sure Redding and Easton children were excited and happy to be in school and that they felt safe. Parents also want to feel safe and secure about their children being in the school buildings. A website called Wait Until 8th was mentioned as a resource for parents who wondered when was the best age to give their children cell phones. Deferring unlimited access to what is happening in the world was suggested as a way to keep children’s anxiety level down. An anti bullying app called Rethink was also suggested. Dr. McMorran said that sharing all of the details about the tightening up of the schools would be similar to leaving the key to your front door in the lock when you went on vacation. He did share that Barlow’s large windows were now lined with a 3m shield that was less susceptible to shatter. All of the interior doors, which only lock from the outside, were double checked. Building management software called School Dude was implemented. Large boulders already present were relocated to provide a place for students to shelter in case of an emergency. The Superintendent explained that schools were built to provide learning and to allow for a quick and smooth egress if an emergency arose. Lock Ins and lock downs were new phenomena so new ways to protect people sheltering in the building have been developed. Steve Schnell from the Redding Police department was instrumental in installing systems where police dispatch can view the feed from school cameras. Both Redding and Easton police departments have collaborated on safety plans with the schools. Currently, Redding has a School Resource Officer (Officer Chris Vadas) in the middle school and a School Security Officer (Officer John Parisi) at the elementary school. Easton has one SRO (Officer Mark Pastore) that spends time in both of the lower schools. These men have an excellent rapport with the students and the programs are working well. Dr. McMorran stated that they are very mindful of building a community where no child feels isolated or victimized Each student should feel they are part of a tribe. The kids need to know that everything is built on a foundation of love so they can prepare for happy, capable lives as adults. Redding’s Captain O’Donnell and Easton’s Chief Shaw went through the training protocols required for their staff. Dr. McMorran then opened up the floor. About 2 dozen parents and students took turns sharing their thoughts and asking questions. Most were in favor of having a Student Resource Officer (SRO) assigned to Joel Barlow High School. A concern was if the SRO would be in addition to the current security staff or would be a replacement. Dr. McMorran and Reg 9 Board Chair Mike D’Agostino explained that the security staff was an integral part of the life of the school. Replacing them was not a consideration. Their costs are covered on the school budget. Traditionally the SRO was a member of the police department and therefore covered on the town budget. Redding First Selectman Julia Pemberton said she was in favor of having SROs and SSOs in our schools. Although, as a shared resource, Easton would have to bear part of the financial burden. Easton First Selectman Adam Dunsby agreed that Easton would pay its share. Both agreed that we needed to decide the best method to keep kids safe and then we’d figure out the dollars. Metal detectors were suggested, although Dr. McMorran had previously stated that he didn’t want to make our schools into fortresses. The idea is still under consideration. The doors at the high school are locked during the school day but open after hours. Parents were unhappy with this policy and wanted to see the doors locked at all times. Several Easton parents said they wanted an SRO in both of their lower schools instead of a shared officer. Michael Klein Wassink, Senior Class President said that school spirit was down. He spoke to the need to pull students into tight knit circle so they could learn to take care of each other. Mackenzie Wenzel, Student Body President, talked about the cultural problem students had with approaching counselors and administration if they had ideas or things to share. She said that she always felt welcome and heard but students needed to be encouraged to do the same. Several other students made comments about school safety. Natalie Hammond and Kim Fox, the principals of the two elementary schools spoke about reaching out to all students to make sure they get the support they need. They stressed that collaboration with parents was vital. Mike D’Agostino thanked everyone for participating in the dialogue and coming out. He advised that this was only the first step and there would be more to come.